Q: Does the property allow child guests? A: Regrettably this property is not suitable for children or toddlers on account of limited space and proximity to the stream. If you wish to bring a babe-in-arms, you will need to bring your own crib and baby equipment. Q: Is this property suitable for a person with physical challenges? A: This property may be unsuitable for those with physical challenges on account of uneven paths, and a step down from the living room to the hall that leads to kitchen, bathroom and stairs. A: Check-in is not before 3 p.m. on arrival day. Check out time is by 10 a.m. on departure day, unless you are departing on a Sunday and no incoming guest is expected. In this case Sunday check-out time is 4 pm, but you will have to check the booking calendar two days before your Sunday departure to confirm that there is no incoming guest that day and you will have to email mirvanya@gmail.com so that the housekeeper can be told. Q: Should I take out travel insurance? A: We recommend that all guests take out travel insurance when they first secure a booking, as it may protect you against cancellation. Q: Will there be a mobile signal in the cottage? A: No, though some mobile phones (i.e. Three) will work with the cottage wifi connection. Other phones will usually get reception, by driving a quarter of a mile up the road towards Stoke. Q: Is there a phone? A: No. However, your own mobile may work (the owner’s “Three” network works!) by using the provided wifi connection. Otherwise you may have to drive out of the valley (towards Stoke) to make or receive a call. Q: Is there TV, DVD or Wifi? A: Yes – all of the above. The tv is attached to a fold-away arm so that it does not dominate the room, when not in use. Q: Will there be sockets for my electrical appliances? A: Yes, we have standard electricity sockets for UK appliances. If you are coming from outside the UK, you will need to bring your own adaptor plug(s) and transformers. Q: Are there any other charges on top of the base rental charge? A: There is a standard cleaning/care-taking charge (£50), and a fee for dogs (£25 per dog.) Also, a charge if you order a swimming towel or extra firewood. The refundable damage deposit is returned to you within a few days of departure. Q: Is this property suitable for gatherings and parties? A: This property is not suitable for events or parties. Q: How private is this property? A: The cottage is very private as the nearest neighbours live in farms that are at least a quarter of a mile distant. On a rare occasion a family member may spend the weekend in the cabin that sits out of sight in its own private garden to the rear of the cottage. Q: Where can I buy groceries on my way to the property? A: There is a large Sainsburys supermarket (with a petrol station) very close to the Roundswell roundabout on the A39 Barnstaple bypass road, but you cannot see the supermarket from the roundabout and – if you are coming from Tiverton direction – you must take the second exit west off the roundabout (your gps will guide you.) There is a smaller grocery shop with all the essentials in Hartland. Q: How does this property compare with others in the area? 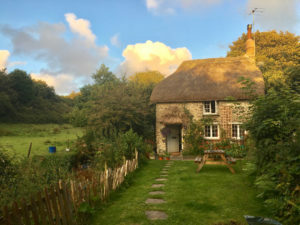 A: The cottage is possibly the most ancient in Devon. It has the features you might expect in a building that is over 500 years old. Although modern conveniences have been added, you may be disappointed if you value a modern and pristine environment over one with ancient character and charm. One such feature is the low height of some ceiling beams and doorways (as the average person was smaller than nowadays, when the cottage was originally built!) Some signs are provided to remind you to “Duck or Grouse!” and padding has been applied in a few places to protect unwary heads. Q: How is the cottage heated? A: The electric heaters have been pre-set for comfort and can be regulated to suit your particular needs, if you email Miranda. Alternatively, you’ll be able to boost or lower the temperature on each radiator on an hourly basis. There is also an efficient wood-burning stove and you will be provided enough wood and kindling for a few fires. More wood is available to buy in Hartland. Q: Does the property allow dogs? A: Yes; one well-behaved small or medium-sized dog over a year old and under the full control of its owners will most likely be allowed for an extra fee of £25 per week, but a request needs to be made by email to mirvanya@gmail.com and confirmed. Q: What is the dog protocol? Dogs should be taken off the property to do their business or – if they poop in the garden – their waste must be picked up and disposed of. Dog waste found on the property after departure of dog-owning guests will incur an extra cleaning charge. A: Apart from a dog, no other pets are permitted. Q: Is there any baby equipment? Q: How is the property accessed? A: The key to the property is in a lock-box on the property and the location and code will be sent following full payment. Temporary parking is available beside the cottage for unloading and entering through the garden gate, after which you can park your car in the gated off-road parking area at the lower end of the property. Detailed driving directions will be sent after booking; a GPS may be helpful for first-timers. Q: Is there off-road car parking on the property for guests? A: There is spacious off-road parking at the bottom end of the garden near the little bridge. The large wooden gate into the parking area has a “Philham Water” sign on it. After parking your vehicle, you can walk through the garden to the cottage (approx. 80 meters.) At night you may need a flash-light, though solar lights along the path may help. A: You will be able to park your car in the space alongside the cottage for unloading luggage and then entering the property through the little roadside gate. After unloading, you will need to park your car in the cottage’s off-road, gated car parking area at the lower end of the garden near the little bridge. Detailed directions will be sent before your arrival. Q: How do I pick up the key? A: The location of the lock-box and the code for opening will be sent to you, along with driving directions, when the deposit has been paid and the booking has been confirmed. A: Please contact mirvanya@gmail.com if you expect to be more than a few hours late. If you arrive after dark, you will need a flashlight but should have no problem locating the lock-box that contains the cottage key, and you will have been sent the code. Q: What is the nearest railway station and how far away is it? A: Barnstaple Railway Station is the nearest, which is 23.5 miles/40 mins from Philham Water Cottage. Q: Can I arrive on public transport? A: It is possible to get a train to Barnstaple and a bus from Barnstaple to Hartland, though there is no bus service out of Hartland on a Sunday. Once arrived in Hartland you will still be 2 miles from the cottage. Paul, our site manager who lives in Hartland, may be willing to provide a taxi service to and from the cottage if you arrange it with him* in advance. Unless you are a committed walker, or intend to remain at the cottage throughout your stay, it is generally best to come by car. *For Paul’s contact details, please email mirvanya@gmail.com. Q: What type of heating does the property have? room and bedroom; a towel radiator in the bathroom. Q: How can I get fuel for the open fire or stove? A: Enough firewood for the first couple of nights will be provided. You can order extra firewood from us, by checking that option on the booking form. Bundles of firewood can also be bought from the general stores in Hartland 2 miles away. Q: What are the kitchen facilities? A: Electric oven and hob; microwave oven; fridge; freezer; dishwasher; washing machine; food processor; full set of stainless steel pans with lids; full set of casserole dishes & baking pans, bowls, jugs and all necessary cooking and dining utensils. Q: What are the bathroom facilities? A: One full bathroom with overhead electric shower above the bath and a towel radiator. Q: Does this property have steep, narrow or spiral stairs? A: The wood stairs are not particularly steep or narrow, but there is a low beam at the top of the stairs, under which a tall person will have to duck . . . or grouse! Q: Is there a garden or outside space? A: Yes; there is plenty of garden and outside space. 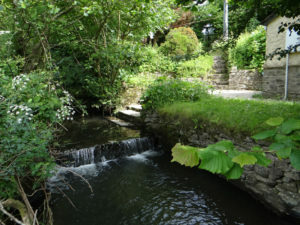 The garden runs between the stream and the lane, with a lawn and patio behind the cottage, and a meandering garden to the front with stepping stones leading to the car parking area. A: Booking early is wise as this unique property and location are popular. Q: How do I address a complaint or problem? A: Every endeavour is made to ensure your stay with us is memorable for all the right reasons. However, we do recognise that from to time things do go wrong. In these circumstances, it is the responsibility of the holiday-maker to make any such problem known to the property manager (whose contact details you will be given before arrival) immediately it becomes apparent, thereby giving her the opportunity to correct the situation as soon as is reasonably possible. Q: Am I insured if I break something? A: We do not carry insurance for breakages. However we appreciate that accidents do sometimes happen. If you have a breakage during your stay, please let Miranda know before you leave (mirvanya@gmail.com) and, if appropriate, we reserve the right to invoice you accordingly. A: Bed linen and bath towels are provided. Please bring your own swimming towels, unless you have included them in your order. Q: Where is the linen for the sofa-bed? A: The linen and pillows for the sofa-bed are kept in the linen chest in the upstairs bedroom. A mattress topper for the sofa-bed (recommended) is stored at the top of the stairs. Q: What is provided and what should I bring with me? tea; coffee; sugar; milk in the fridge. Q: Do you allow more than two guests? A: The cottage is set up for two guests, but can accommodate three or four at a pinch, as there is a small-double sofa-bed downstairs. Extra guests must be named on the booking form or by email. A: By direct online deposit into the owner’s Philham Water Cottage Account at the Royal Bank of Scotland in the UK. If you prefer to pay in $, please email Miranda (mirvanya@gmail.com) directly to arrange payment. Q: Do you accept payment in other currencies? A: The website booking facility is set up to accept only £/sterling payments. Therefore the website’s payment page provides the necessary codes for international payments into the cottage account. Payment in US $ may be possible, if you email Miranda (mirvanya@gmail.com) to arrange. Q: Will I pay a deposit? Q: What is the booking fee? A: There is no booking fee. Q: When are the changeover days? Q: Can my holiday start on a day other than the designated changeover days? A: During most of the year you can start and end your stay on any day, though there is a 2-night minimum stay. From June to September you must start or end your stay on a Monday or Friday and there is a 3-night minimum. Q: How do I book a short break? A: You can use the booking calendar on this website to book a stay of 2 nights or more. However, from June to September (peak season), you can book a 3-night weekend starting Friday, or a 4-night midweek break starting Monday. Q: How can I cancel or change my booking? In the event that a cancellation is made, a cancellation charge may be payable depending on the number of days before the Holiday start date that your Cancellation Notice is received (by email to mirvanya@gmail.com). Please see the table below. If it is possible to change your booking dates, no cancellation charge will be made. Cancellations made up to eight weeks before the start of your stay (i.e outside of any specified periods below) will be charged the deposit only, and the balance of your total payment to date will be refunded. Q: Who do I contact with a question or request?